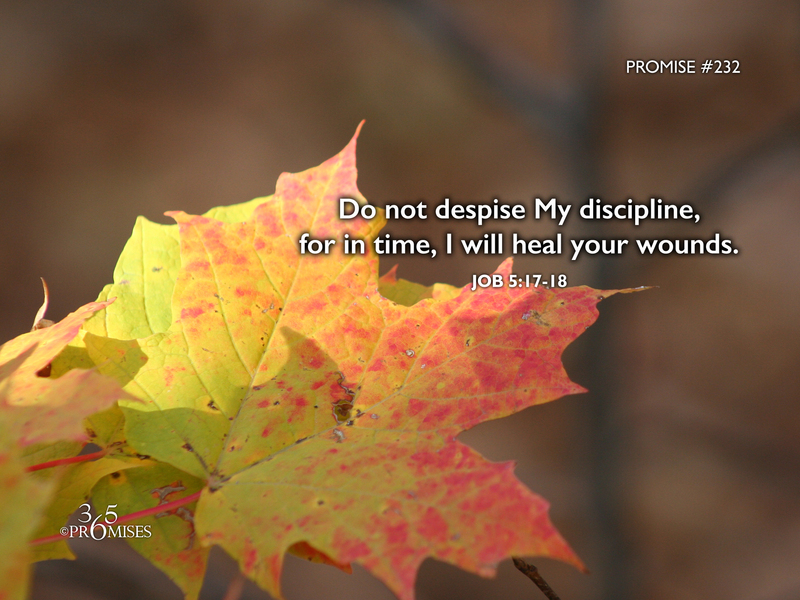 Do not despise My discipline, for in time I will heal your wounds. 17 “Behold, happy is the man whom God corrects. 18 For he wounds, and binds up. You may be reading today's promise and wonder why I would have ever chosen a Bible passage about discipline and wounding to be part of 365 Promises. We don't hear too many sermons preached about the discipline of the Lord and if we do, they may be skewed from the perspective of the punishment from an angry God. When many of us think of the word 'discipline', we think of our own life experiences with our parents, teachers, authority figures, etc. This does not usually bring up warm feelings of love and tenderness, but rather feelings of guilt, shame and pain. In Hebrews 12:4-11, the writer encourages us not to despise the Lord's discipline for God is treating us like His sons, because our Heavenly Father does not discipline us in anger but in absolute unconditional love. Every son (or daughter) receives discipline. Receiving discipline is part of the evidence that we do indeed belong to God. The root word of discipline is disciple, which at its heart, is training. God is training us to become like Jesus and walk in His ways. In Hebrews 12:4-11, the writer does acknowledge that no discipline is pleasant at the time, but it eventually results in a harvest of righteousness. In today's promise, we have an assurance that though we may be enduring hardship now, there is a promise of healing for all our wounds. My prayer is that we would not see God's discipline through the lens of how we were disciplined by authority figures in our lives.